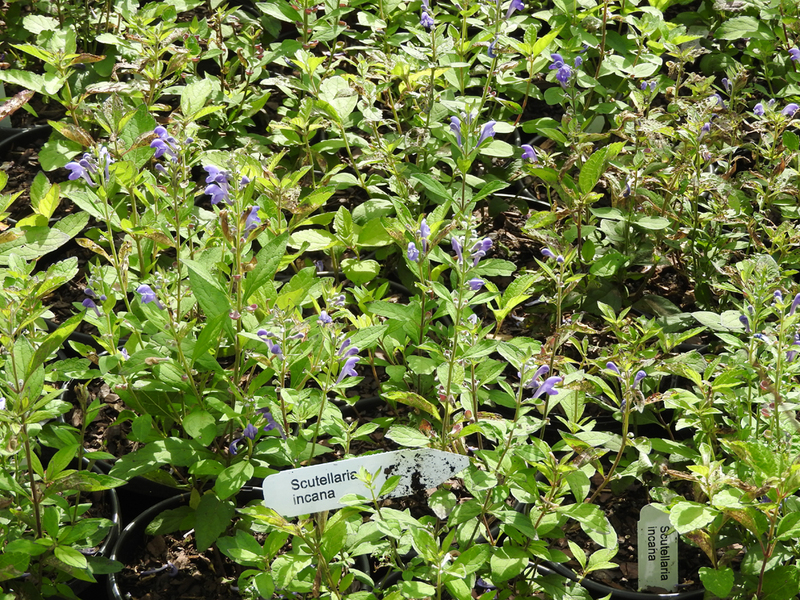 Today we are all excited about Scutellaria incana which must mean that our lives do not have enough natural excitement in them. We are excited also because we have a bunch of it because it is easy to grow, but do not tell anyone else as we want to, finally, have a plant that is easy to grow and easy to sell. 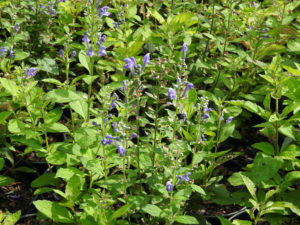 We are still wondering about the easy to sell part, but it is a native plant—common name ‘Hoary skullcap’ which should be good for something—and these days native plants are the hot thing. Some people even sell Monarda bradburiana as being a good plant, which reminds me that we will have this plant to sell as soon as we can figure out how to grow it from seed. 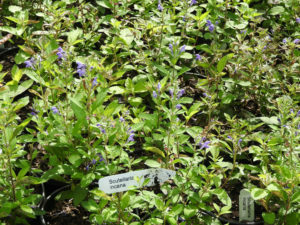 Anyhow, the scutellaria came to us from Roy Diblik of Northwind Gardens fame and he told us that we should grow it. I forgot to ask him, at the time, if it would help us in our life plans, which were to make enough money to retire sometime before the inevitable heart attack catches up with us. Besides Roy, I see that North Creek grows it, and they are a reputable operation. 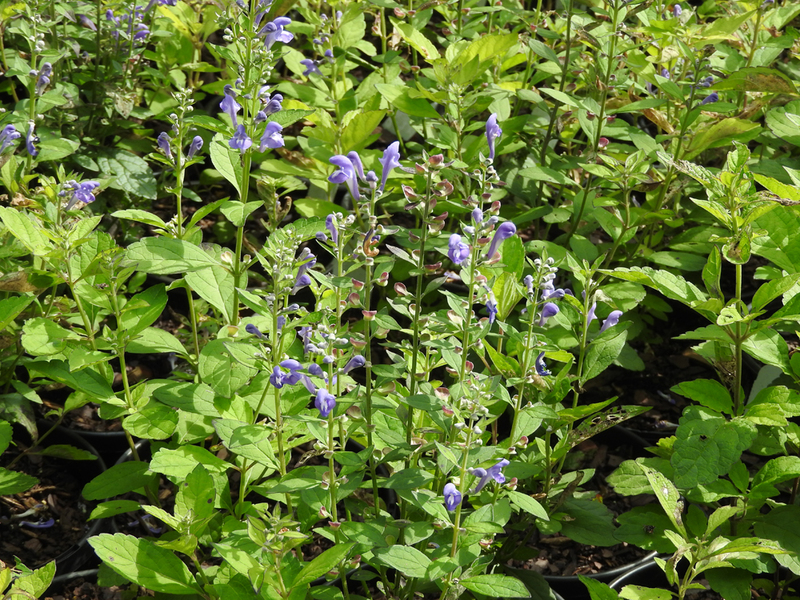 Here is what they say about the plant: “Scutellaria incana features strong, upright growth with eye-catching, deep-blue flowers, making it an excellent choice for the sunny garden. This partial shade to full sun perennial attains a height from 24-36” tall with darkly-colored stems, 2-4” long oppositely-arranged leaves and many striking, rich deep-blue flowers in mid to late July.” Next time I will just tell you to look at North Creeks’ very fine website and thus save me the typing. At this time we have some new gallons in stock and thus have not seen the plant out in nature, and so can make no claims as to how it looks or grows. We will start up propagation again in March and thus will have too many of these skullcaps by early summer. If we do not sell them, then my reputation as being an ace number one prognosticator prestidigitator person will be tarnished, and we do not want that to happen. There is not much more that I can say to sell this plant. If you want it and can use it, then we want to supply it, just let us know so we can have it ready when you want it. Other than that, being a native plant, there is a strong resemblance to a weed. I found the polar opposite of Scutellaria the other day while wandering out in among our acres of field plantings—Sedum ‘Pillow Talk’ PP28,528, one of the Intrinsic patented introductions. The photos tell it all—it is gaudy and shocking pink—the best combination ever. Song Sparrow says that it attracts butterflies. 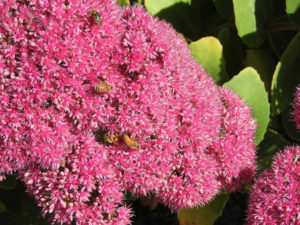 All that I can say is that it attracts lots of bees or flies that look like bees or some similar insect that buzzes and acts like it is enjoying the flowers. If you know what to look for you can see them in the photos. 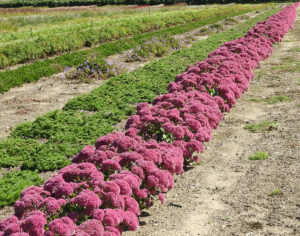 This sedum blooms in September and the book says that it blooms until winter. We will find out in a couple of months and let you know. As with many many fine plants that bloom after mid-summer this one will not sell in the garden center and so the general populace will never know. Therefore, it is the responsibility of the landscaper, the design-build landscaper person, to include this plant in their palette. I have been waiting all week to use that word and then I have been awake nights worrying about misspelling it as either palate or pallet; these words sound a lot alike. 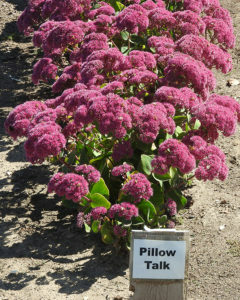 Brent from Intrinsic has gone nuts breeding these larger sedums but not quite a big as ‘Autumn Joy’. Some are variegated and some have light colored blooms and we have them all, but this one is the most dramatic. We have a lot of them in gallons except that we are short on skilled help this summer and so the gallon pots did not get either trimmed or spaced. They look kind of strange the way they are. When you order please tell the sales people that you have a sense of humor and that you will be planting them for next year anyhow. If you do not have a sense of humor, then do not order them or get ready to stake them up; maybe a peony cage will do the job.